We can get limited numbers of first-grade Icelandic horse hides. They are smaller than regular horse hides (sometimes "pony-sized"), soft to the touch, and make excellent floor pieces. Our Gxx codes denote individual pieces. 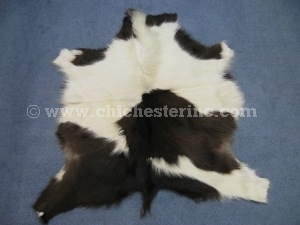 If you would like to order a specific Icelandic horse hide, please go to our Gallery to pick the exact one shown. No export permits are required for shipments outside of the United States. Icelandic horse hides are not an endangered species and are not subject to CITES. The horses were not killed just for their skins.